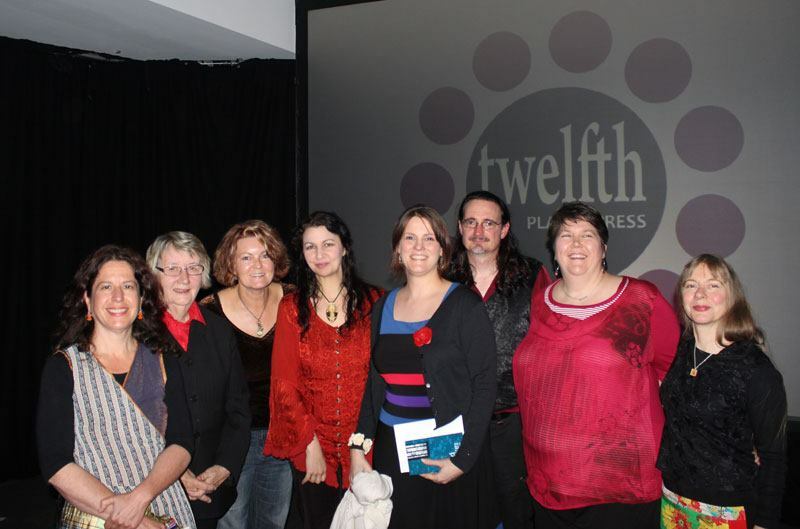 Twelfth Planet Press at MWF: now that was fun! Kaaron Warren, Rosaleen Love, Cat Sparks, Kirstyn McDermott, Deborah Biancotti, Jason Nahrung, Narrelle M Harris, Lucy Sussex. The Twelfth Planet Press Showcase at the Melbourne Writers Festival last night was quite a buzz, with most if not all seats taken (thanks everyone for coming! *) and an engaging variety of readings from the assembled Twelve Planets authors. The Twelve Planets is a series of — you guessed it — twelve collections, each of four stories, from Australian writers, and seven of them were on hand last night to provide a taste of what’s on offer and what’s on the way. Reading were Kaaron Warren, Rosaleen Love, Cat Sparks, Kirstyn McDermott, Deborah Biancotti, Narrelle M Harris and Lucy Sussex — Kaaron, Cat and Deb all came from interstate to attend. Kerry Greenwood ‘launched’ the series from under her witch’s hat in suitably charming fashion. Lucy’s partner Julian Warner was MC. It was quite a thrill to have Talie Helene provide backing music for my reading from Salvage, a recent, separate Twelfth Planet Press release. Also in the audience was Peter M Ball, who wrote Twelfth Planet Press titles Horn and Bleed, and I am annoyed we didn’t rope him in for at least a photo op. Kudos to the MWF staff who made sure all ran smoothly and allowed to hover in the bar area afterwards until the call of dinner finally took us out into a relatively balmy Melbourne night. There was much chatting, the readings did seem to have connected with the audience, and there was even some book signing going on. So where to go with 20-odd people at eight o’clock on a Sunday night? Il Primo Posto on Southbank came to the rescue. Sure, they said, we can fit you all in, and at the one table. The food, delicious and reasonably priced, came out in good time; the wine list hit the spot without breaking the bank; the staff were wonderfully friendly and efficient and accommodating. I can’t speak highly enough of the restaurant. It was my second visit, and it won’t be my last. It was a shame that Twelve Planet author Deborah Kalin couldn’t make the gig (missed you, mate! ), and that Twelfth Planet Press founder Alisa Krasnostein couldn’t journey across from Perth to be a part of the event she’d bankrolled with nibbles and bar tab. As it turned out, Alisa was at her own function: accepting a Biennial Women Achievers Award recognising her editing and publisher roles at TPP as well as the press’s World Fantasy Award win last year. A dual celebration on either side of the country! Very nice indeed. * especially the Harper clan, some of whom had to help clear a car accident to make it, and those who I know had to travel a few hours to get there! This entry was posted in books and tagged alisa krasnostein, il primo posto, melbourne writers festival, twelfth planet press, twelve planets. Bookmark the permalink.